Exchanging emails recently with a young man about a vocation to the priesthood, I asked why he felt someone should be drawn to the priesthood, his reply was, "to forgive sins". Personally I thought that was pretty good, but maybe not what most bishops would regard as the normal answer, some might even find it an unacceptable answer. Co-incidently, I then read Fr Z on Pope Francis' little homily from yesterday morning. It really is brilliant, I think I am going to put it on the back of next Sunday's newsletter. Fr Z is the expert "fisker" so read it there, rather than the Vatican Radio form below. Interesting, JPII generation of priests wanted to teach or preach the faith, Benedict XVI generation of priests wanted to celebrate the liturgy reverently. I wonder will the Pope Francis generation want to be priests because they want to forgive sins. How exciting if they do". In many ways what Francis says explains his motto: Miserando atque Eligendo my loose translation "I was given mercy and as a consequence I chose". A priest must be someone who is aware of God's mercy and his need for it. He should be ashamed of falling short of God's love, and be uncomfortable with it and want to seek God's mercy through the Sacrament of Mercy, often. Pope Francis doesn't seem to be against daily confession, "And if tomorrow I do the same? Go again, and go and go and go .... He always waits for us". Obviously there are dangers of a priest pandering to a neurosis or a penitent failing to make a firm enough purpose of amendmentment but with a wise confessor can deal with that but God's mercy helps us to stop sinning. A priest never wastes time hearing Confessions or going to Confession himself. Amongst clergy we need to create culture of frequent Confession. Perhaps Pope Francis will do that, that will certainly be a huge step to "humbler, poorer Church", a Church that identifies with sinners. I have met plenty of "good" priests and bishops, the less impressive ar those who are naturally good, the more impressive are those in whom one can actually see the workings of Grace. 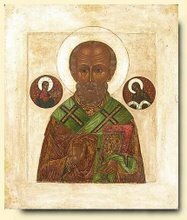 Not necessarilly the most good but certainly the most Holy, was a Bishop who lived with two elderly priests, who used to speak about them as "my confessors". I think he used to go to confession daily, either to one of these priest, or to a priest who he was visting, or to a priest who confessed to him. This confidence, concluded Pope Francis "gives us room to breathe." "The Lord give us this grace, the courage to always go to Him with the truth, because the truth is light and not the darkness of half-truths or lies before God. It give us this grace! So be it. " Peronism in the Apostolic Palace? A political journalist friend of mine said, "If you want to understand Pope Francis, you have to understand Peronism". Certainly, Argentina's press seem to want to paint him as a Peronist. Not being Argentinian, I don't understand it but it is something that can embrace the Kirchners but also those who oppose them. It seems to be about a strong (and benign) populist leader, who sets out to gain mass support, the message is simple: the national good, national harmony, national solidarity, an appeal to the majority, to the workers, in other words "the poor". Peronism was Argentina's own response to the dictatorships of Europe. If one subtracts the Hitler pact, racism and the castor oil of pre-war Mussolini, who got the trains running on time, virtually destroyed the Mafia, brought about a sense of hope, economic well being, vitality and national pride, might well be more accessible model for Europeans. Mussolini was essentially a moderniser, who re-presented the dream of the ancient Rome. Someone once suggested that Mussolini modelled himself as a secular Pope and to some degree Pius XII modelled himself on Mussolini. I am certainly not suggesting that Papa Bergoglio is a latter day Mussolini but getting the Church's trains running on time, getting rid of corruption, regaining the masses seems to be his mandate. The message of simplicity, or in fact simplifying the message, popularising, de-intellectualising seems to be what we have seen so far. 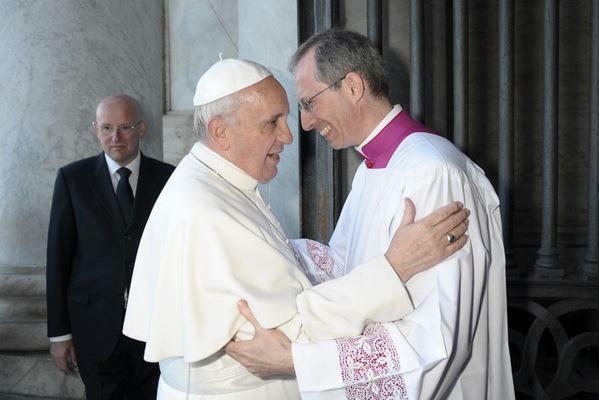 Despite the Tablet and other journals, Archbishop Piero Marini and a few other Curial members, the German Bishops, even our own Bishops, to some extent, presentation of Francis seems to want to present him as a break with Benedict, apart from the outward signs of Papacy, there doesn't seem to be a doctrinal rift, on the contrary Francis seems, in the best sense of the phrase, the poor man's Pope Benedict, speaking to the masses rather than an elite. In deed the announcement this week that he intends to complete Benedict's encyclical on Faith seems to suggest continuation rather than rupture. Even when he speaks to the Cardinals as he did on St George's day his message ended simply, "Avanti! Avanti! ", (which might well ring bells, of good or ill, with certain Italians) or to biblical scholars, he seems more concerned to communicate to the doorman or the cleaners or the security men, or those beyond his immediate audience, to the masses. As Curial reform is very much in the air, let us start from basics. Is this true? "Most of the bishops, instead of being the strong characters presently needed, dynamic and active personalities, even if indeed pious and religious men are in effect at the same time mediocre, or even below mediocrity. Some are apathetic, timid, indolent or vain; others are conformists, bureaucrats or introverts; many are ignorant and clumsy administrators. Sometimes the whole episcopate of a country looks like a bunch of cripples". "As for the cardinals, the senate of the Church and the electors of the pope, here the situation is even worse, particularly in the case of those attached to the Roman curia. The sacred college contains too many non-entities who have reached their rank by never asking awkward questions. The merit of many eminences is not their excellent pastoral experience or learning, but that of having staffed a Vatican desk for a very long time. Without any real knowledge of the world or the life of the universal Church, they are nevertheless automatically promoted and placed in executive jobs far above their modest talents." "Almost half of the cardinals and the great majority of the curial ones are Italians, as if the Holy Ghost had a distinct preference for the Italian nation. This only aggravates the matter, for even if Italians may have many talents, they are certainly not noted for their organizational skills. For the universal Church, this is at the same time both an insult and an injustice. The few excellent foreign prelates present in the curia are examples of what the alternative might look like." These aren't my words, they weren't even written recently, neither are the the criticism of someone on an extreme of the Church but by Willem Marinus van Rossum, a Dutch Redemptorist Cardinal who was Prefect of “Propaganda Fide" with Benedict XV and Pius XI. In fact His Eminence actually is pretty damning about mediocre Popes too! Read more here. Van Rossum's solution is "Collegiality", which seems to be the solution that VII and Pope Francis put forward, and practically everyone else. It probably is the answer but then Collegiality also brings problems - "too many cooks spoiling the broth", springs to mind, especially if the cooks are not too competent. What the Franciscan Papacy will bring, if anything, is too early to tell. So far it has brought about a fair degree of confusion, organs like the Tablet, America and NCR seem to think that everything including doctrine is up for grabs. The German Bishops have reversed rulings by Rome over abortiofacients. Other Episcopal Conferences seem to see the new Papacy as a time for continue to do their own thing, to appoint their own men, to build up their nationally distinct churches. A Papal transition has always been a time for the worse of clerical activities; score settling and jockeying for position, power grabbing, intimidation, factionalism and gossip. The worse excesses of this happened before Benedict's election, during JPII's long death. The continuation between him and his successor who knew an awful lot about the different types of filth and a great deal about the problems of various Episcopal Conferences meant that apart from the press and getting Cardinal Sodano out of the Secretary of States office and apartments the transition was reasonable smooth. Pope Francis on the other hand is a complete outsider, who will take months at least, if not years, to "learn the job", if he is actually interested in doing so, whereas Benedict had twenty years plus understudying JPII at the CDF. As far as E&W is concerned Benedict seemed to have deep understanding of both the history of modern Catholicism here, as well as, so I am told, by those who have discussed it with him, an understanding of our present problems too. As a polyglot I understand he was a regular, if critical, Tablet reader. I can't imagine that Pope Francis is, or has bothered to find out more than he was told by Archbishop Nichols on his recent visit with our Bishops to the Holy See, which probably means we will be left to go our own sweet way. As with England and Wales, so with the US and so many parts of the world. Allowing that to happen is probably the easiest option but strongly local or national Churches growing in independence of Rome have historically always ended up in schism. That is the story of the Reformation, of Jansenism, of the rise of the Old Catholics and as Pope Bergoglio is only too aware of Liberation theology. Whilst guarding against Ultramontanism and excessive centralisation a weakened Papacy will bring about weakened sense of unity, and therefore of the faith. The great weakness of the Papacy is the Pope himself, as Van Rossum said it is a superhuman task, placed on the shoulders of a rather frail mediocre human being. A serious question is can it continue to exist in its present form. One of the problems Pope Francis must address is the Church's relationship with the media, especially those closely associated with the Papal Court. I don't just mean the rather poisonous words of one or two Curial Archbishops who seem to want emphasise, not just a break in the Papal wardrobe with this Pope and his predecessor but real doctrinal differences. The problems seem much deeper. The Pope also said that the 'organizational aspects' of the Church should never be first in line. At that point, he said, the Church runs the risk of collapsing and becoming an NGO. If you listen to the original, his unscripted weekday sermons are a bit rambling -see the RR recording of his St George's day sermon- but Vatican Radio in its English report seems to have airbrushed out these particular remarks, which, as there are strong rumours going around Rome that if the bank can't clean up its act it will be closed, seem pretty important. As Peter above all the Apostles is given the specific role of feeding the Lord's Lambs it is important his words are reported accurately, it was precisely because his message was often distorted that Pope Benedict acted through Moto Propria and issued the texts of his teachings. The BBC have a rather wonderful programme about Tomas Luis Victoria: God's Composer. I hadn't realised St Theresa of Avila had actually written a reference for him, in fact I hadn't ralised he grew up in Avila, he seems to have been one of her many proteges. He would have associated with her other proteges like St John of the Cross, he was also a contemporary of El Greco. In a world, even a Church, where beauty is so often held in contempt and everything seems to take on a certain uniform beigeness it is interesting to reflect on the extra-ordinary nature of the time of Victoria and his associates, his time in Rome I knew a little about, though it is hardly mentioned in the programme. He was an associate of St Philip Neri, he presumably knew St Ignatius, St Camillus de Lellis, he would have sang for and composed for St Pius V.
Holiness flourishes where there is holiness and where there is a general desire for excellence, external and internal beauty and even extravagance. The saints and artists, and saintly artists of the 16th century captured hearts and minds and formed a culture of beauty. Do we have anything to learn from this extraordinary time, or is it just to be consigned to the museum? Sandro Magister has an account Bishop Ioan Ploscaru of the Greek-Catholic diocese of Lugo Romania who suffered for the faith through fifteen years of torture and imprisonment. My cell was in the basement. The windows were broken, and the cell was very cold. I remained there for the whole month of December until January of 1950. The cold was torture for me. I was often taken to the interrogators at night. They would send me back and, after half an hour, I would be woken up again for another interrogation. The cold of the frozen cell consumed me. I slept very little, always with the urge to wake up again and move around. The chill came in through the broken window, leaving traces of frost on my beard and clothing. In three weeks I lost a great deal of weight. I prayed and offered all of the cold and all of the trials to the Savior. I love this altarpiece painted in honour of St George. One can dream that one day, when it is returned to the Church it might be possible to celebrate Mass before it. It gives us the two narratives of St George, the dragon slaying, fair maiden rescuing, perfect chivalrous knight, and in the other panels the endless and painful tortures that led to him being called the "Glorious Martyr". Dragons, speaking beasts with eyes and horns and crowns are very much part of the Apocalyptic tradition, so understanding them is no problem for us, George wrestles with beast in order to tame it, it is above all an image of the spiritual life, of the struggle that goes on within all of us until the tamed beast can be led chained into city of God. The other panels show the various tortures George goes through before he dies for Christ, one suspects that any possible torture was added by the painter, until the whole thing becomes a catalogue of human brutality. The original story of this near eastern martyr is lost under layers of suffering upon suffering. In this sense George becomes an image of every-Martyr. His actual death is lost amid the process of enduring pain for Christ and receiving his divine reward. It is the mythical nature of St George that I am sure made him so appealing to the medieval mind, and had him almost dropped even in England in the hyper-rational 70s. In my Paul VI breviary there is nothing except a hymn in the Propers for England an Wales. I was rather taken by this headline, "Unemployed Sicilian man 'murdered his parish priest because he couldn't bear to listen to any more sermons". I am one of those priests who preach a short sermon every day, and I suppose preach a little too long on a Sunday. I don't think I am untypical of priests around here. But I wonder if we actually preach too much, certainly the daily sermon is modern phenonoma, even the Sunday sermon wasn't absolutely necessary before the Council, at least not at all Masses. A friend tells me he was concelebrating with a priest and asked him to use the shorter version of the Gospel in the Lectionary, because he had rather a lot say. "Oh", said the other priest, "I'll look forward to that, I haven't heard much that is more important than the Gospel of the Lord!" I don't tend to feel a need to preach at the Extraordinary Form. I wonder if some priests, obviously not me, preach because they want to "control" the Word of God rather than leave it to work on the hearts of the faithful, is there a bit of mistrust here? or is it a compensation for the absence of silence? or is it insecure priests needing therapy? One of my parishioners was up at St Paul's with the great and the good at Lady Thatchers funeral, I can't help but be a little amused by the thought of "Mrs T" preferring a privatised funeral put out to tender, but let's leave that wicked thought there. Looking at the footage there were quite a few politicians and public figures who are not known for their Christian faith. I sympathise with the authorities at St Paul's, there is strange mixture of Church and State coming together to provide a piece of national pageantry. Now, as a nation we no longer follow the rhythms of the Christian calendar, there is a need for public celebrations of public grief and joy, and Royal weddings or funerals, or funerals like yesterday's fulfil a need. 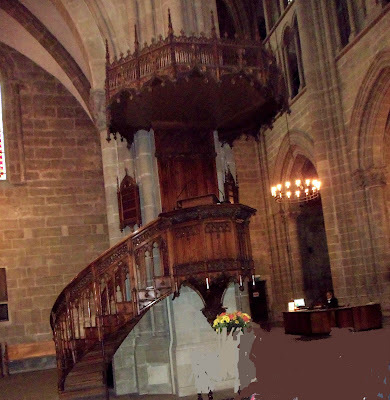 The problem for the Cathedral authorities is how to avoid, on the one hand, merely supplying a space for a national event and on the other hand presenting something which is beyond the comprehension of those present and those viewing on the television. The answer the cathedral authorities came up with was a blend of stately ceremonial, using such signs and symbols as black vestments, unbleached candles, together music and texts that spoke of Christian hope. I know the hymns were the Baronesses choice, and presumably the use of the King James Bible, but I suspect much else was provided by the clergy in consultation with her children. As a 'bespoke' liturgy it worked well, it spoke of a Christian sense of the tragedy of Christian death and of Christian triumph over death. For all its splendour it had a simple message. For a different congregation such as group of ardent believers a more complex message might have been given. I had a conversation with a priest friend recently and we were trying to understand the difference between Benedict and Francis and came up with the idea that Pope Benedict could speak to those who understood the significance of the pontifical dalmatic or the fannon whereas Pope Francis is speaking to people who barely understand that Christians are supposed to be good and trust in God. Hence so many journalists seemed incapable of comprehending anything Pope Benedict said but seem to latch on the Francis' baby kissing or condemnation of grumbling or tarot cards. I am not sure how Archbishop Nichols, or more likely his successor will deal with the semi-state funeral of Tony Blair - now we have a precedent it is bound to lead to that. As Catholics we do not have the facility to strip down our liturgy (or our theology) at Requiem Mass to the kind of service St Paul's put on yesterday. The tragedy of Christian death and of Christian triumph over death, is certainly there in a Requiem Mass but actually for a modern mixed congregation without careful explanation half of what happens - the liturgy of Eucharist - most are lost and have no idea of what is happening at the altar, and even more so at the altar rail. So many of the people we celebrate funeral's for, both the corpse and its relatives, are very far from being Catholics in good standing, they are often like Mrs T herself in irregular marriages, with their own theology and with a morality that is far from that of the Church. All means of communication are forbidden! This seems to be what Archbishop Nichols is suggesting in a recent sermon in a Mass for Pope Francis. Pope Francis understands this in practical terms. He has already identified two kinds of behaviour that destroy love in the Church. They are complaining and gossipping. He is a practical man. He knows that we live in a society in which complaining and gossip is a standard fare. They sell newspapers and attract us to blogs because we love hear complaints and to read gossip. One of my parishioners used to work in a shady business were above the counter on the staff side hung a notice, which said, "The customer is always wrong! ", actually it was a branch of Social Security, the Church can adopt this sort of triumphalism so easily. His Grace, as Deacon Nick, points out is very seriously misinterpreting the Holy Father, bloggers who are hopefully within the Church are right to be a little concerned about His Grace's words following his condemnation of those who criticised his support of the Warwick Street dissident Masses with the sharp rebuke "they should hold their tongues". Gossip is diabolic, especially when it is tinged with calumny, as Pope Francis has also pointed out. However there has been, especially over the last 40 years, a rather deliberate effort to silence any legitimate criticism of the Church whilst as Pope Benedict said "dissent" is mistaken "for a mature contribution to a balanced and wide-ranging debate". There is a certain bias in supporting those who we agree with and condemning those we disagree with. The Church, or its leadership, should never regard itself as above criticism. We are no longer living in the age of the Inquisition, nor are we living in that time when the heirarchy could cover-up the clergy's criminal activity.Cardinal Sodano dismissed the media's reaction to sexual abuse scandals within the Church as "petty gossip". There is gossip and there is gossip, some gossip is actually necessary and a sign of health. Fr Henry makes the comment, "some lowly Catholics further down the hierarchical system find that their "complaints" (i.e. concerns, anguishes, agonies and fears) often go unheard and unheeded - the use of the modern means of communication - including blogs - gives many a voice who are otherwise ignored. It democratises the Church in a good way but, of course, it means that those at the top are more readily held to account." Today Pope Francis spoke about the Holy Spirit driving the Church forward and the danger of those who want to drag the Church backwards, "We don’t want to change and what’s more there are those who wish to turn the clock back.” "This is called stubbornness and wanting to tame the Holy Spirit.” The great achievement of the Second Vatican Council was to open up the Church and to recognise the legitimate pluralism within it. To go back to a time when people like Archbishop Nichols could command tongues to be held whilst at the same time permitting the Tablet to be sold at the back of his Cathedral and dissidents to lecture in his diocese is indeed a turning back of the clocks and quite contrary to everything we have seen of Pope Francis so far. I think I understood Benedict, I have to admit I don't understand Francis! Benedict amazed with his brilliance in his sermons and catechesis, Francis will probably remembered for the simple homely preaching at his early morning Masses at Domus Mater, for rubbish collectors and policemen, with their simple homely message: be faithful to Christ, tell the truth, be meek, be gentle. Benedict was that wise scribe who drew out from his store room things both old and new. Francis, maybe it is his Jesuit sense of poverty, doesn't seem to have a store room. Benedict and Francis are obviously closely related, Benedict was the kind and wise grandfather, Francis the kind old uncle, who delights in surprising you. Recently, when he left his apartment at Domus Marta and went out into the hall, the Pope found a Swiss Guard standing at attention outside his door. He asked him, “And what are you doing here? Were you awake all night? “Yes,” the guard answered respectfully. Quite what Il Capitano and his fellow guardsmen made of this I wonder. What I find rather exciting is Benedict taught us to connect our worship, theology and belief, Francis seem to teach us to connect simple kindness to belief. Christians should be known for their kindness. which I think he said in one of his sermons to the binmen, policemen and cleaners. Perhaps that is one of the qualities above all else that we need to relearn. 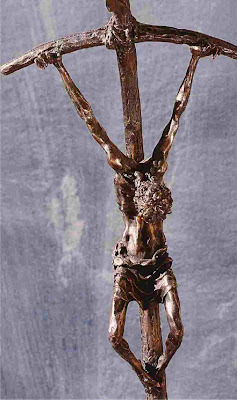 Broken, tortured, twisted, contorted are the words that come to mind looking at this crucifix. It has the sense of being in flux, half-formed, raw in its conception. It is still incredibly disturbing, what it represents is truly disturbing, the death of Christ, which represents something beyond the story of the Gospel but actually what I find disturbing is the mind of the artist that imagined it. It comes from the era of brutalism of concrete and "machines for living in", from that artistic period when art itself hung stretched and distorted before its own death, screaming in agony at its fear of its own pain, confronting humanity with its own ugliness. Some have suggested it is a Jansenist image, I don't know about that. It represents humanity debased. Here is the victim of man's inhumanity to man, there is nothing divine here, it is absolute self emptying. Here is man mangled and remade by the regimes of Stalin and Hitler, Pol Pot and Mao, and yes, of the murderous torturers of South America. Here, grace is excluded, the hand of God is absent. It symbolises too the uncertainty of the post-concillior Church, stripped bare, in flux, not fully formed, a broken human institution, humbled, gasping in a particular moment of history, more dead than alive. It is austere without any beauty. It is the Church of Good Friday, devoid of any sense of Grace, or of Easter hope. I can understand its appeal to Paul VI, it seems to sum up everything we know about his tortured loneliness, and for John Paul II it seemed to sum up his sense of the "victimhood" of his rather Polish spirituality, in the same way I can see why Pope Benedict rejected it, it fitted uneasily with his theology of "Joy" and "Man-Redeemed", the traditional Papal Ferula, gilt empty victorious cross of the now risen Christ, spoke eloquently of his own theology. 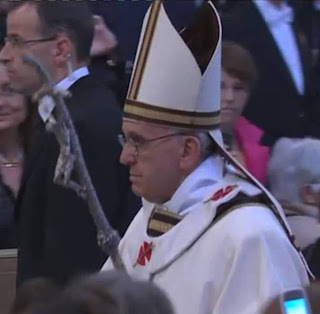 Last night Lello Scorzelli's ferula reappeared at the enthronement in the Lateran in the hands of Pope Francis. More than any other Papal ornament it symbolises a return to the time before Benedict and a return to the uncertainties of Paul VI, and to a more austere Church. For Pope Francis it perhaps a symbol of "the poor", and a sign of an austere Church, in an austere world. For a Pope ordained priest in 1969 it is perhaps "the" symbol of the "modern" Papacy, for someone whose priesthood was spent in Villas and in the oppression of the Peronist and post-Peronist Junta, it is perhaps the perfect symbol. For the rest of us it is a return to a period in the history of the Church which many priests of my age and older see as being the Church of their youth, it marks a rupture with Benedictine reforms, whether Pope Francis intends this to be said I doubt but it certainly marks a return to the past. Perhaps it was too soon to put away those arrangements of Kum-by-yaa. Messy thing the Incarnation: it is all about nappies and bodilly fluids on the part of the Incarnate and worry and misunderstanding on those who love him. If only God became a set of ideas, rather than a person. I have been fascinated by the reaction of a few clerical bloggers and twitterers who either shocked or delighted by finding themselves in the "precarious class", the bottom one, of the BBC's class survey. I have always been amused that there actually exist one or two Catholic institutions that would refuse admittance to Jesus because he wasn't really the right class - not enough quarterings on his Father's side. At times I am a little horrified by my own reaction to people: would it have been possible that if I lived in first century Palestine that I might have lost the chance of salvation simply because I had a predjudice against Gallilean's wth bad table manners, who had just too much of the odour of the fish market about them? The terrifying thing is that it is possible! Protestants really have things much better than us, they believe in book, which can be translated, printed, edited and even bound exactly to their taste. We however believe in a person but who rather dangerously is brought to us by other people. "Whoever listens to you listens to me". Frightening! I knew of a rather "refined" woman who having been received into the Church by a rather charming, well educated, aristocratic Irish priest, she promptly lapsed when he was replaced by a rather boorish and dull English one. She stayed lapsed for thirty years while he was in her parish, coming back only a few months before her death. Being Catholic is about our relationship with the Church. What unites us to it is the theological virtue of Charity and therefore the recognition that we have no choice but to love - remember Jesus commands us to love, "I give you a New Commandment: Love on another". It is this commandment to love which is at the basis of a Catholic sense of Communion. I had a conversation with a follower of the SSPX recently, it was late and I wasn't thinking clearly, his concern was that Rome was now demanding Bishop Fellay et al accept the "Living Magisterium". We could both agree on the meaning of "Magisterium". It is after all something tangible it can be found in various catechisms or Denziger, we had a problem with "Living Magisterium". As important as doctrine is, merely accepting a list of proposition does not make one a Catholic. In fact many good Anglicans, who have not joined the Ordinariate but stayed in the Anglican Communion could do that with more understanding than many Catholics, but evidently they are not Catholics. What makes a person Catholic is communion with Bishops in Communion with the Pope and wanting to be in that Communion for love of Christ. The precarious nature of Catholicism is that everything depends on an obedient filial love (even if one loathes or disagrees violently with them) of the Pope and those bishops in Communion with him. The Magisterium cannot be treated by Catholics as Protestants treat the Bible. We must treat it as something which "is being" passed on and therefore something living, rather than something which "was once" passed on and therefore is now dead. The Apostolic Faith, the Living Magisterium, comes from the Bishops in Communion with the Pope, they and those in Communion with them are the possessors of it, it exists in their communion, rather than as something separate from them. It comes from their Apostolicity, rather than being found on a library shelf in a book. This is the difference between the Magisterium as some object and something alive within the Church. Thus whether the Pope wears red or black shoes, is ascetic like Pius V or a blackguard like Alexander VI, it is in him and those Bishops in Communion with him where we find the Living Magisterium, apart from him it is something dead, the home of bookworms and experts, beetles and historians. The problem for the SSPX (and Protestantism) is the objectivaction of the Magisterium and seperating from the life of the Church, it is a heresy that springs from regarding the teaching of Christ as something that can be contained on a printing page rather than something which is lived and living. In the messiness of the Incarnation the Living Magisterium is to be found in the prejudices, myopia, stupidity, folly, sin, ineffectuality, even infidelity and heresy of the Apostolic college - if I were God I would do things differently but I am not - thank God! My friend, the good Fr Zeee has a new sub-heading to his blog:: reading Francis through Benedict, I hope he keeps it up. He has this very insightful post up on the Pope's catechesis, which took place today on the women witnesses to the resurection. I reproduce the relevant section here the heavy type is Fr Z's and the red his "fisking" (sorry it looks a bit of a mess). 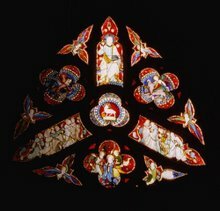 I like Father's repeat mention of angels as the first witnesses, the Incarnation and resurrection are first witnessed by Heaven. Another element. In the professions of faith of the New Testament, only men are remembered as witnesses of the Resurrection, the Apostles, but not the women. This is because, according to the Jewish Law of the time, women and children were not considered reliable, credible witnesses. [See what he is doing? See?!?] In the Gospels, however, [! ]women have a primary, fundamental role. [There it is! The GOSPEL account is NOT culturally-conditioned, locked into a woman-repressing mentality. The Gospel, the Christian message, breaks with that.] Here we can see an argument in favor of thehistoricity of the Resurrection: if it were a invented, in the context of that time it would not have been linked to the testimony of women. Instead, the evangelists simply narrate what happened: the women were the first witnesses. [Actually, the angels were the first... but let that pass.] This tells us that God does not choose according to human criteria: the first witnesses of the birth of Jesus are the shepherds,[again, the first were really angels... but let that pass...] simple and humble people, the first witnesses of the Resurrection are women. This is beautiful, [this is fantastic!! Now wait for it...] and this is the mission of women, of mothers and women, [MOTHERS!] to give witness to their children and grandchildren that Christ is Risen! Mothers go forward with this witness![MOTHERS!] What matters to God is our heart, if we are open to Him, if we are like trusting children. But this also leads us to reflect on how in the Church and in the journey of faith, women have had and still have a special role in opening doors to the Lord, in following him and communicating his face, because the eyes of faith always need the simple and profound look of love. [By being MOTHERS. He isn't talking about Church ministry. Far from suggesting anything about leadership positions in ecclesiastical structures, Francis is talking about having babies and being strong Catholics.] The Apostles and disciples find it harder to believe in the Risen Christ, not the women however! Peter runs to the tomb, but stops before the empty tomb; Thomas has to touch the wounds of the body of Jesus with his hands. In our journey of faith it is important to know and feel that God loves us, do not be afraid to love: faith is professed with the mouth and heart, with the word and love. A friend of mine reminded me of the old saying, "As lost as a Jesuit in Holy Week". I don't want to get into another discussion about liturgy and the relationship of Popes to Law of the Church, because the same friend reminded me that there was a time when no-one in the Church really spoke about Liturgy, they simply got on and did it. I was struck that in this morning's Gospel the Magdalene is so involved in her grief, so bound in on her misery that she doesn't recognise the Lord, in fact I am not sure which woman in the Gospels is Mary Magdalene or who isn't, I tend to think the women who is on her knees at the Lord's feet or sitting at them is the same woman. In the Resurrection she is raised up and sent to the Apostles, with words, "Go, tell ...". Jesus is always about imperatives, he holds up the Centurion who says, "I say to my servant do this and he does it," and seems to expect to be treated the same by Jesus. The soldier, Ignatius of Loyola seems to have seen himself doing the same thing with his new Order, he was all about imperatives, "Go, convert China!". "Go, risk death in England!" When the disciples seem to want a nice spiritual chat about prayer, Jesus simply says, "When you pray say, Our Father...", he gives the explicit instruction which could be, "When you pray do this". Over the last fifty years he Concilliar model of Church has dominated, discussion, endless discussion has dominated but the Gospel has nothing about discussion, it seems to be the very antithesis of the Gospel, the demons or Satan want Jesus to get into a discussion with them, it the desert Satan is rebuffed by a verse of scripture. The practicality of the Gospel's call to feed, clothe, visit is about doing, there is no discussion, or even much thought, if you see someone hungry, the Christian response is to feed them, that is it. At the end of the Gospel, at least Mathew's, Jesus really says, "Go and teach...". As I have said I find Pope Francis washing of the feet of a Muslim girls quite disconcerting, even Popes must be bound to the Law, by the same token I actually rather approve of his spontaneity. He said something recently about self help courses can turn us into Pelagians, we really do have to learn to start doing things as Christians, it seems in that way Christ teaches us how to be Christians. One of the things we Catholics seem to have lost sight of is that we are called to do good, so that we might actually be good. The great problem for us today is the world does not see us "doing good" and therefore doubts we are good. A happy and Haly Easter to you all! The controversial former Anglican Bishop of Durham David Jenkins cause controversy by saying the Resurrection was more than a conjuring trick with bones. He was a silly man but here he was spot on, though a little irreverant, though I am not convinced he was convinced the resurrection had much to do with flesh and blood, or even bones, at all. Christ rose in the flesh, this is the Christian faith but the Ressurrection is far more than a remembered historic fact. Today, Easter day, is about another Truth of the faith, it is about our resuurection. Christ descends to earth, to suffering, the Cross, death and even into Hell, as we say in the Creed so we might ascend into Heaven. "He came down so we might go up", "He died, so we might live", "He died so we might rise with him", "By dying he has conquered death". The ancient icon of the Anastasis which belongs to both East and West shows Christ descending into hell and grasping the hands of our first parents and leads them and righteous dead who died before him into heaven. He, "the Resurrection and the Life" opens not Paradise but Heaven. Adam and Eve lost us Paradise but he has opened Heaven to us. We were enemies of God, rebels against his Law, strangers, foreigners, his death and resurrection has made Co-heirs, adpted sons and daughters, a holy nation, a royal priesthood a people set apart. His Resurrection is for us even more significant than Creation for it is our Re-Creation, re-creation according to Grace, that is why we keep Sunday as our Holy Day, it is the day on which God begins creation, the first day of the week. The Resurrection is the beginning of mankinds recreation. The first was creation by nature but the re-creation is according the Grace, God's Free Gift, which is what Grace is. Resurrection is not simply Life after death, after our last breath or even at the end of time. It is Life here and now too. The saints were fully alive, they are our models. Many Christians today are far from saints, far from alive, even the Church herself seems only partially alive, sometimes like a body lying in ITU with a feint heart beat, or sometimes we are rather like Zombies, moving but more dead than alive, sometimes like vampires really dead but appearing to be alive, sucking the blood out of the living, and reality affecting other Christians with the contagion of not taking either the practice or the day to day living of the faith seriously. Today's feast makes us ask, "Are we alive or dead", do we prefer the grave to the Life of Grace God offers us. Pope Francis in a sermon as Archbishop said that some people prefer their pets or cosmetics or a whole lot of other things to serving the poor. Christians who are alive want to serve the poor either by caring for their physical or spiritual needs. We can gauge whether we are alive by whether we do that: Is our relationship with Christ something we want to share or something we keep to ourselves imprisoned in the tomb? The Pope speaks about a poorer Church, if it sold off every art treasure or chalice bought by the pennies of the poor, it would do little for the world but if Christians, Christians who are alive really used their own wealth, their money, their time, their skills for the poor, rather than merely worldly pursuits, then the Church would come life, then we would be the leaven that raises the dough, the light in the darkness of the world. We, ourselves, as the Body of Christ, would be the Resurrection and the Life. Do you want to be alive or do you prefer death?